Virtual world goods seller PlaySpan has received $6.5 million Series A in a round led by Easton Capital, Menlo Ventures, STIC and Novel TMT Ventures. 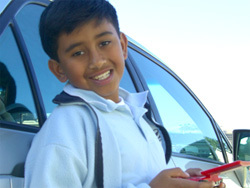 The interesting side of PlaySpan is with the background story: PlaySpan was founded by Arjun Mehta (pictured) , a 6th grader from Silicon Valley who founded the company from money earned selling online game items won from quests he fought while attending 5th grade at Challenger School in San Jose. No word on when PlaySpan will be launching.